Andrew Zentner, PhD, University of Pittsburgh presents “Our Universe: The Past 13.8 Billion Years and the Future”. Like the universe itself, data about the cosmos continues to expand. Zentner’s research aims to make predictions that are unique and testable in a continuing effort to understand what’s happening on a galactic scale. His work ranges throughout a broad cross section of cosmology, encompassing galaxy formation, the phenomenology and identification of the dark matter and dark energy, and astrophysical limits on fundamental physics. Café Scientifique is always held on the first Monday of the month. Food and drinks are available for purchase. Doors open at 6 pm. Event is free but parking is $5. Meet local astrophotographers and space artists. Last chance to view and buy art. CopyLeft Gallery pop-up art gallery space, 127 Brownsville Road, Pittsburgh, PA 15210. Join us to celebrate the juncture of art and science. The gallery will bring in new guest artists weekly until June 4. Join us on June 2nd in painting kitchen cabinet doors with space art. Two local artists and an astronomer will be on hand to help. Wear old clothes that you wouldn’t mind getting paint on. CopyLeft Gallery pop-up art gallery space, 127 Brownsville Road, Pittsburgh, PA 15210. Join us to celebrate the juncture of art and science. The gallery will bring in new guest artists weekly until June 4. Peter Freeman (Department of Statistics, Carnegie Mellon University) presenting. Call Lou Coban (412-321-2400) at Allegheny Observatory for reservations to the May 20th Public Lecture in Astronomy. “Making Sense of the Galaxy Menagerie” by Peter Freeman (CMU, Dept. of Statistics). Every third Friday of the month (except December) there is a public lecture. The public lecture nights start at 7:00PM with some light refreshments, the lecture starts at 7:30PM and lasts approximately one hour. After the lecture there will be a tour of the building. Reservations are required and may be made the same way as for a tour (see above) with the exception that reservations for a public lecture will only be accepted the Monday at 1:00P.M. following the previous lecture. Please Note: Due to the overwhelming demand and the limited space for the public lectures we’ve made some changes to the public lecture registration procedure. The changes are as follows: Only 2 reservations can be made per person per phone call for a lecture. Only 30 people who’ve attended the previous lecture can sign up for the next lecture, the rest of the available reservations will be reserved for people who have not attended a lecture previously. Ongoing: Call for artists for Saturday, May 7, 6:00 pm, “Doors to the Universe” CopyLeft Gallery pop-up art gallery space, opening night, 127 Brownsville Road, Pittsburgh, PA 15210. Join us to celebrate the juncture of art and science. The gallery will bring in new guest artists weekly until June 4. Join our interdisciplinary class of students, made up of engineers, architects, scientists, designers, computer science majors and creative technologists, as we explore a concept for an inflatable/deployable (semi)autonomous greenhouse for Mars. The two courses “Building an Atmosphere” and “Responsive Mobile Environments” deal with both the structures and systems needed to sustain life in an extreme alien environment while engaging also in broader cultural interactions. Panel Talk – Designing for Mars with guests from NASA Johnson Space Center, NASA Jet Propulsion Lab, and NASA Ames. Followed by a presentation and exhibit of student work. Refreshments provided. This event is free and open to the public. Please pass along the invitation. All are welcome! Steven Quick (Remaking Cities Institute, CMU) will be speaking about street light research after the short YouTube video, Pitch Bright. Help us make a PSA for the City. Limited seating, must register. $4 per person over age 2. Jessica Kester (Jessica@TheOutdoorClassroomPA.org), Program Manager for Native Americans, this month is known as the Pink Moon. Learn many more lunar, celestial, and environmental facts during this hour-long walk in the dark! Scout and community groups are welcome and pre-registration is requested. Swiss Film Award winner: Best Documentary, Best Editing, Special Prize for Sound Mix. Director Nicolas Steiner will speak after the film, joined by two Mars Desert Research Station crew members (Diane Turnshek and Nora Swisher). 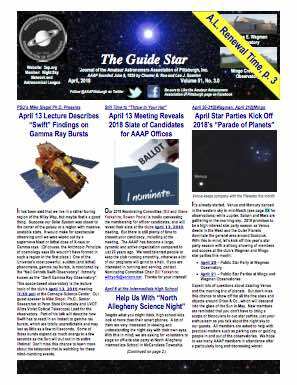 Hosted by the Department of Physics and Astronomy at the University of Pittsburgh. Free, no reservations necessary. Abstract: Since the federal government is the primary source of support for research in physics and astronomy, every member of our community should know what is going on in Washington. This talk will cover the policy and political context for R&D at the federal level, relevant current events in Washington, and what our community can do to help shape future events. Short bio: Dr. Joel Parriott (American Astronomical Society), has been the Director of Public Policy at the American Astronomical Society for three years. He brought to the AAS a decade of experience at the White House Office of Management and Budget (OMB), where he was responsible for overseeing both the National Science Foundation and the Department of Energy Office of Science (including Ames Lab) on behalf of the President. Prior to his service at OMB, Dr. Parriott spent four years at the National Research Council on the staff of the Board on Physics and Astronomy, where he supported numerous high-level studies, including the 2001 Decadal Survey of Astronomy and Astrophysics and Connecting Quarks with the Cosmos. He earned his doctorate in astronomy and astrophysics at the University of Michigan.